Lease a brand new Civic for only 99/mo!....Guaranteed minimum 6 grand for your trade, no matter what condition it is in!.....No credit, no problem we will get you approved today! What do all these phrases have in common? One thing, to get you into the dealership so they can tell you something along the lines of, "Well yeah that is what we advertise but it doesn't apply to you." Deceptive or false advertising is nothing new in the automotive world, but for some reason it has lasted longer than in other industries. Turn on the television, listen to the radio, or open up a newspaper, I guarantee you will find a dealership making promises they have no intention of keeping. New '13 Honda LX Sedan for only….$99/mo! Hey that sounds like a pretty good deal, that is until you read the fine print which states- "On select models with approved credit...to well qualified lessees with approved credit...159/mo for 36 months $19999 due at signing...all prices exclude sales tax, title and tag fees…pictures for illustration purposes only." Now wait a minute, I thought the lease was for $99/mo but then it says $159/mo so which is it?...And the vehicle pictured for "illustration purposes" is a 23k Civic Si not an LX model with an MSRP of $18,390. 6 grand over KBB for your trade or 6 grand off dealer advertised price! Wow 6 grand off! That is a lot of savings...wait a minute..."$6,000 off, over or back off the dealer posted price, dealer to retain all rebates, including recent college grad and military. On new Hyundai vehicles only.Not available on leases.Can not be combined with any other offer.off, over or back if you qualify for the recent college grad $900, active military $500, and $500 Hyundai owner loyalty! Loyalty and or conquest rebates can no longer be applied towards a lease.This promotion is not valid on 2013/2014 Hyundai Tucson, Veloster, Accent, Azera, please contact us for more details. Clean CarFax required on trade in. Deal extension is good until new incentives arrive or 1/31/14. Not valid on prior deals." So in order to qualify: I have to have a trade, be a recent college grad, active military, AND a Hyundai owner!..And the reason I'm getting the 6 grand off is the dealership gets to keep those rebates. What the…? These types of ads end up making the customer feel deceived and taken for a ride. More and more customers want to avoid the typical dealership experience. While there are numerous dealers that have gotten wise and don't play these games, there are far too many stuck in old ways. As I buyer's consultant I have found direct correlation to how a dealer advertises and whether or not they will cooperate with an inquiry from me. When I contact dealerships like the ones above asking for competitive price quotes via email, they are reluctant to give me what I want. I suspect that they know I will call them out on any inconsistencies with their offers and they would rather not bother when there are plenty of suckers rolling into the showroom daily. But here is the thing, the number of "suckers" is quickly declining. There always be "uninformed" buyers, but the internet has become the great equalizer and tolerance for these type of practices is getting less and less. Just recently the FTC investigated some Kia dealerships for advertising low monthly payments only to increase those payments dramatically on customers after 3 months. I have found that while many dealerships are guilty on some level, it seems that Hyundai and Kia dealers are especially notorious. I wrote not long ago that this approach could hurt their ability to play in the luxury market. This is perhaps why Hyndai's Equus concierge program by-passes the dealers directly. Of course as informed car buyers we all know to ignore these "teaser" offers, and shop smart. 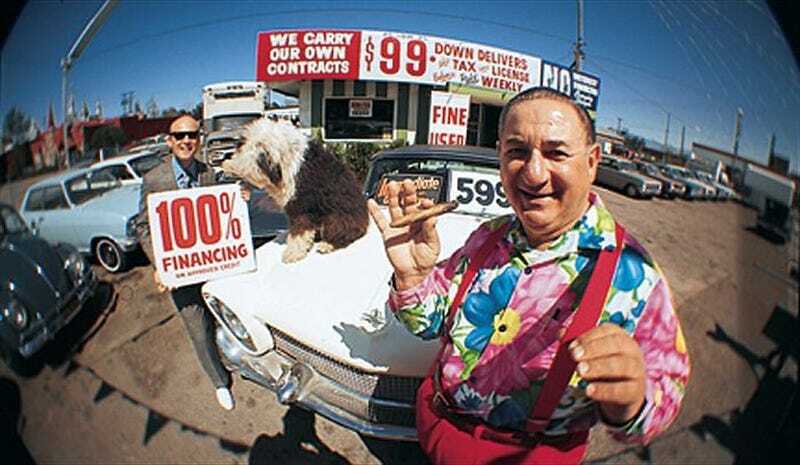 However, these advertisements are often a clue as to a dealership's sales philosophy. Does it mean that you can't get a great deal at places like these? No, I'm sure there are deals to be had. But in my experience getting that deal at these places as a seasoned car buyer is going to take some work; keep in mind whatever bargain one dealer can give someone else can too, maybe even without the games.